Rifaat Assad, the younger brother of Syrian President Hafez Assad, is widely considered to be the most formidable challenger to the nascent authority of the aging dictator's son and heir apparent, Bashar Assad. Rifaat, a member of Syria's Alawite minority, was born in 1937 in the village of Qurdaha in the Syrian province of Latakia. He studied Political Science and Economics at Damascus University (he later earned an honorary PhD in Politics from the Soviet Academy of Sciences). He joined the military shortly after the Ba'ath Party seized power in March 1963 and rapidly advanced in rank. In 1965, Rifaat was appointed commander of a special security force loyal to the military wing of the Ba'ath, which played an instrumental role in its 1966 victory over the party's civilian leadership and later supported his older brother's overthrow of Salah Jadid and seizure of power in 1970. During the 1970's, Rifaat's unit evolved into the so-called Defense Companies (Saraya Al-Difaah), a highly mobile elite force of 55,000 men, equipped with tanks, artillery and helicopters. The Defense Companies were the praetorian guards of the Assad regime, playing a central role in the Syrian government's suppression of the 1980-82 Islamist insurgency which culminated in the brutal February 1982 massacre of up to 20,000 people in the city of Hama. Like most other high-ranking members of the regime, Rifaat used his position to amass considerable wealth, acquiring an extensive network of businesses and properties in Syria. Rifaat's growing power was deeply resented by other senior military commanders at the time--especially Ali Haydar, the chief of the Special Forces; Ali Duba, the chief of the army's intelligence service; and Ali Aslan, the army's deputy chief of staff. When his brother suffered a debilitating heart attack in November 1983, Rifaat decided to preempt the seemingly imminent succession of one of his rivals by sending his forces into the capital to occupy several strategic positions, resulting in brief clashes with other Syrian army units. After his brother's recovery, Rifaat backed down, but the Syrian President nevertheless began limiting his authority. In March 1984, he appointed Rifaat one of Syria's three Vice-presidents (a relatively powerless position) and issued a decree transferring his command of the Defense Companies to another military officer. This drove Rifaat into open sedition and he ordered his forces to march back into the capital and seize power. After a brief standoff, Hafez made perhaps the most risky and brilliant political maneuver of his career by arranging for their elderly mother to fly down from Qurdaha and stay at Rifaat's house in Mezze. The Syrian dictator then drove unescorted to Rifaat's heavily-guarded residence and confronted him in the presence of their mother. "You want to overthrow the regime?" Assad asked. "Here I am. I am the regime. "1 After a lengthy argument, Rifaat became very emotional and backed down in return for a promise that his position and interests would be respected. After the crisis, Rifaat began explicitly challenging the policies of the Syrian regime, openly advocated warmer relations with the West and calling for political and economic liberalization. His brother reacted cleverly (and with a touch of ironic humor) by dispatching Rifaat on an open-ended "working visit" to the Soviet Union in May 1984. Over the next several months, many of his closest associates in the party and military apparatus were ousted and Syrian officials leaked to the press that Rifaat was persona non grata. Rifaat moved to Geneva and began conspiring against the regime, reportedly meeting with Yasser Arafat, his brother's arch enemy at the time. 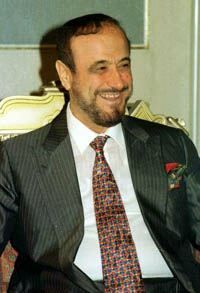 Rifaat spent most of his time in France, Switzerland and Spain, though he retained the nominal position of vice-president until February 1998. He returned to Syria in 1992 following the death of his mother and stayed there off and on until 1998, when he again went into exile. Rifaat's reputation has been damaged by the perception that he is a communitarian (Alawite) chauvinist. He has also been accused of having "mafiosi" behavior, a charge that has earned him a hateful notoriety. Syrian observers believe that the activities of Rifaat was appropriate to a certain phase in the Alawite conquest of power and the establishment of the Assad clan's (al-Kalbiyah) preeminence in the Alawite community. This time is gone. First, he still has many loyalists inside the army and many supporters in the Alawite community. Second, he has a close personal relationship to the man who will assume power in Saudi Arabia after the death of King Fahd, Crown Prince Abdallah (one of Rifaat's wives is the sister of Abdallah's wife). Third, Rifaat's polygamous marriages, along with the marriages of his sons and daughters, have produced strong alliances and cross-cutting ties with prominent families and prestigious clans within Syria. After having married one of his cousins from al-Qurdahah, Amirah, a year younger than he, he married Sana' Makhlouf, a cousin of Hafez Assad's wife, Aneesi, then a young women from the traditional Sunni Muslim establishment - Raja' Barakat. His fourth wife, Lina al-Khayyir, is from one of the most prominent Alawite families in Syria. His daughter Tumadir married Muin Nassif Khayr-Bek, who belongs to the most powerful and prestigious Alawite family. Tamadhin, another daughter, married a Makhlouf, thus consolidating the alliance with this strong Alawite family beyond the first generation. His daughter, Lama, married Ala' Fayyad, the son of Alawite General Shafiq Fayyad, the commander of the Third Armored Division and later the head of the Damascus army garrison. His oldest son, Mudar, married Maya Haydar, the daughter of the ultra-rich entrepreneur Muhammad Haydar from the prominent al-Haddadin Alawite tribe. Despite all the inter-rivalries within the family, the Assads have not directly employed violence or imprisonment against each other, though many of Rifaat's followers have been killed or jailed. An interesting incident happened late last year when Mahir, the younger son of Hafez Assad, shot and injured his brother-in-law, Assef Shawkat, because Assef was criticizing Rifaat. Mahir contended that Assef, although married to his sister, Bushra, is an outsider and he has no right to trash his uncle because the conflict with Rifaat is an internal affair within the Assad family. 1 Patrick Seale, Asad: The Struggle for the Middle East (University of California Press, 1988), p. 433. 2 An-Nahar (Beirut), 21 October 1999.